In between dog training I’ve had time to do more beading. My goal is to post the results of my work along with a description of the products used. 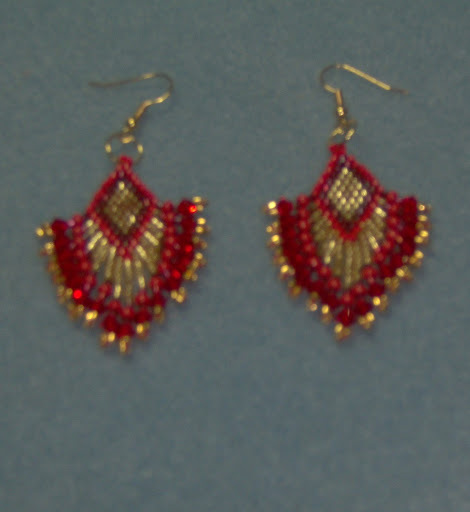 This isn’t the greatest picture but it shows some variation from a pattern (Fanfare Earrings) I saw in an issue of the magazine Step By Step Beading. I used Nymo thread size D and next time would use a smaller size. The Delicas and size 8 beads were on hand as were the 4mm Szarovski crystals (color Lt Siam) that I purchased a long time ago at the Bead Fest in Portland, Oregon. It was a fun project even if the heavier thread made it a challenge to go back through some of the beads. I used the Brick Stitch to make this. This entry was posted in Beading, brick stitch, Dogs, earrings. Bookmark the permalink.